61 June/July 2018 unmanned systems inside ENGINEERING. PRACTICE. POLICY. dynamics without needing a doctorate to do so. The site also features how-to videos and training tutorials. 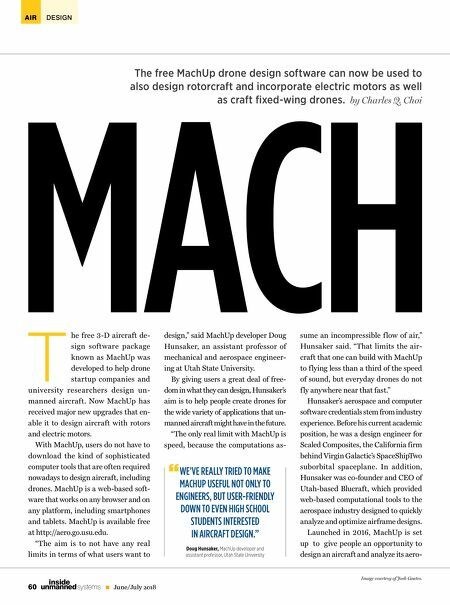 "We've really tried to make MachUp useful not only to engineers, but user- friendly down to even high school stu- dents interested in aircraft design," Hunsaker said. "I've used a number of other air- craft design software, both paid and open-source, and MachUp tends to be the easiest to use," said Samuel Weiss, a MachUp user and aircraft designer at Teal Drones in Utah. "A lot of other software is too complex—good for re- searchers, but not so good for students or entrepreneurs or hobbyists." ROTOR REVOLUTION As popular as MachUp has proven, with roughly 5,400 registered users so UP far, one main drawback of the software until now was that it could help develop fixed-wing aircraft but not rotorcraft. Now, with the newly released fifth ver- sion of MachUp, users can design the kind of multi-rotor aircraft often seen in the commercial drone market. For many aircraft, "from small RC [re- mote-controlled] models to full-size civil aviation aircraft, propellers can have a strong impact on the aerodynamics and performance of the airframe," Hunsaker said. "Not only does the propeller pro- duce thrust and torque, it also produces a slipstream of fast-moving air which can drastically change the effectiveness of lifting surfaces." The option to design rotorcraft was originally included in the precursor to MachUp that Hunsaker created about 12 years ago for his master's degree. He ended up rewriting that sof t ware from scratch to develop MachUp, "but did not have time for that last step of adding propellers in," he said. Josh Goates, a master's student in mechanical engineering at Utah State University, incorporated rotors into MachUp 5. One of the main challeng- es he faced in making this upgrade was that many models of the air f low produced by the propeller "are based on inviscid theory, which imagines the air f lowing nice and smoothly," Goates said. "However, important fac- tors including viscous effects, where particles of air interact with one an- other, are needed to make these mod- els more accurate." The method that MachUp uses to model the complexities of propeller UPGRADE Gets a Rotor-Friendly WHERE TO FIND IT • MachUp is available free at http://aero.go.usu.edu. • Users can also download the Python version of MachUp on USU Aero Lab's GitHub page: https://github.com/usuaero. 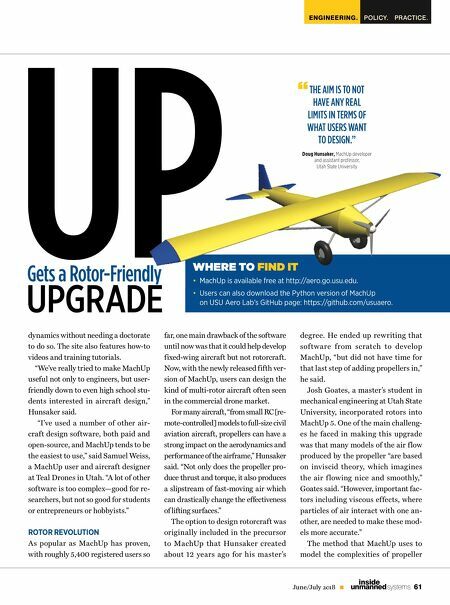 UP UPGRADE Gets a Rotor-Friendly WHERE TO WHERE TO FIND IT FIND IT • MachUp is available free at http://aero.go.usu.edu. THE AIM IS TO NOT HAVE ANY REAL LIMITS IN TERMS OF WHAT USERS WANT TO DESIGN." Doug Hunsaker, MachUp developer and assistant professor, Utah State University "